Autumn is definitely my favorite season, but for some reason I never decorate for it. However, since Baby G&D is due just after Christmas I decided not to deck the halls this year and instead opted for a little fall decor which I can put out and take down while I still have the energy (and the time)! See Chase peeking into the picture? She decided to take a break from napping in her favorite sunspot to get in on the photo op. A few weeks ago we went for a hike to enjoy the beautiful fall leaves, and afterwards stopped at a pumpkin farm. 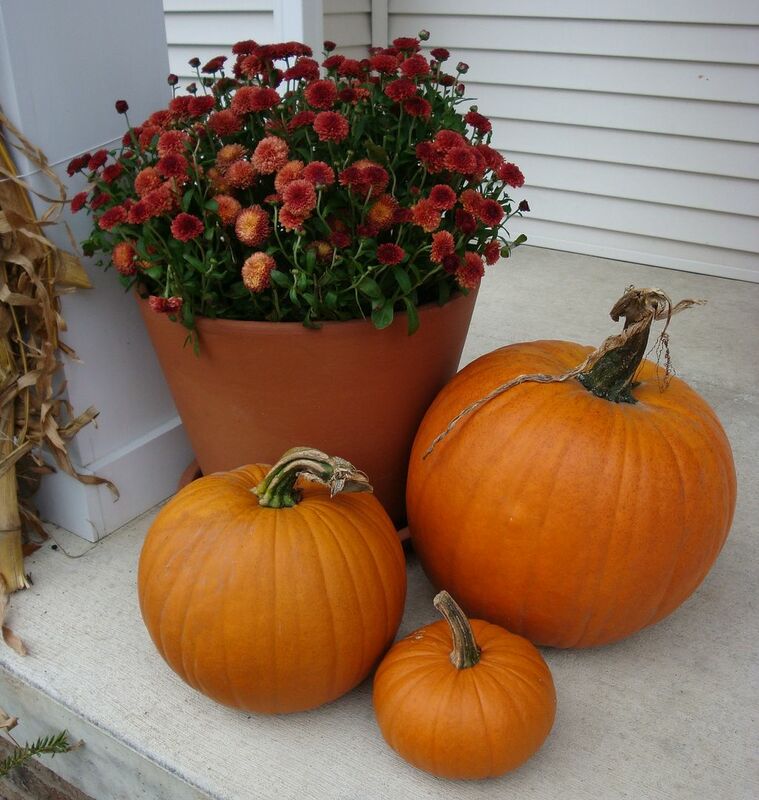 We got the pumpkins on the front porch and these adorable mini pumpkins which were only 8 for $1.00! The powder room with a pumpkin spice reed diffuser which makes the entire main level smell so delicious! I love fall! 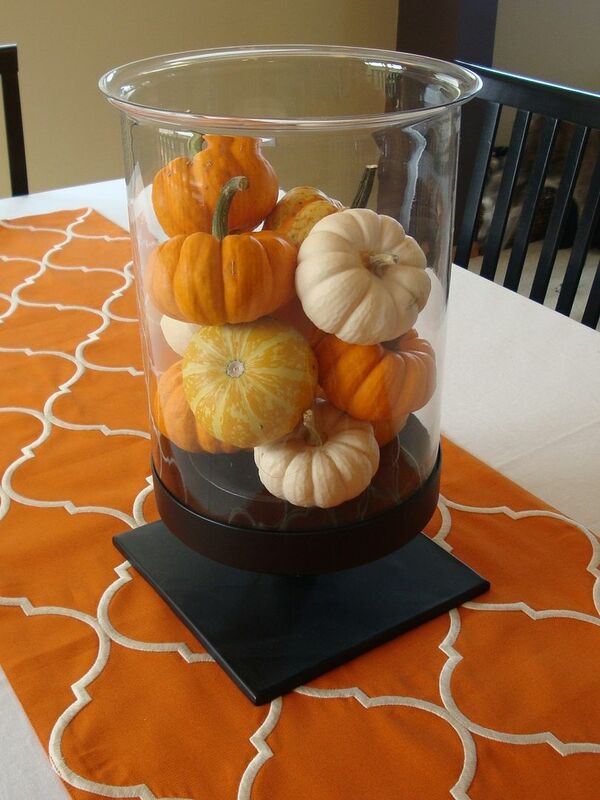 I’ve been looking all over for the mini pumpkins, they look great in your apothecary jar. I love the autumn touches! Looks great! I love that runner and the door mat the best!!! Good work! You have the most beautiful home and the decor is lovely. I like the door mat. We got a fall doormat at Target last year and I love it. I love your fall decor! It’s little touches like that, that make your home feel cozy! And i LOVE your doormat!! Sooo cuute!! 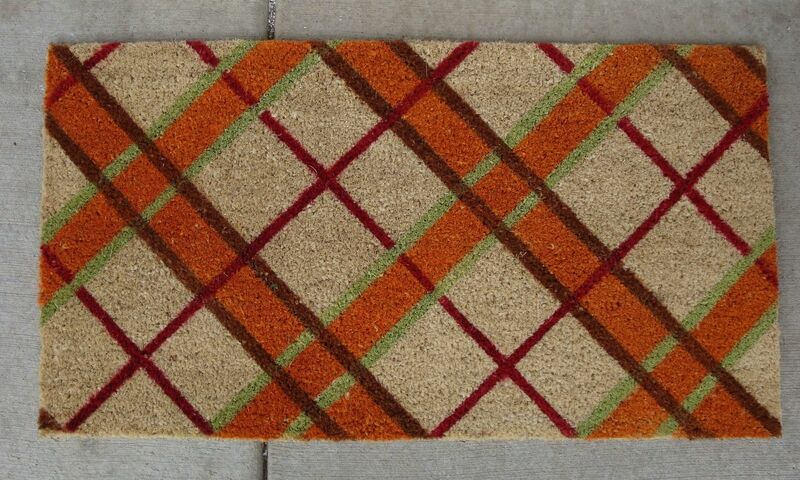 Oh the doormat is adorable! 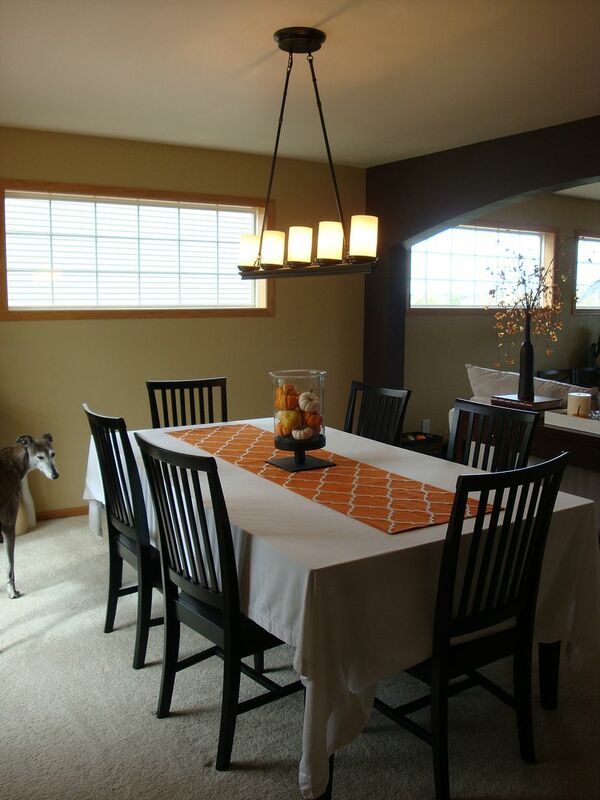 I also love the light fixture above the dining room table – very unique! Again with the Target. Everyone seems to get so many nice things from there. When will Canada get a Target, gah! 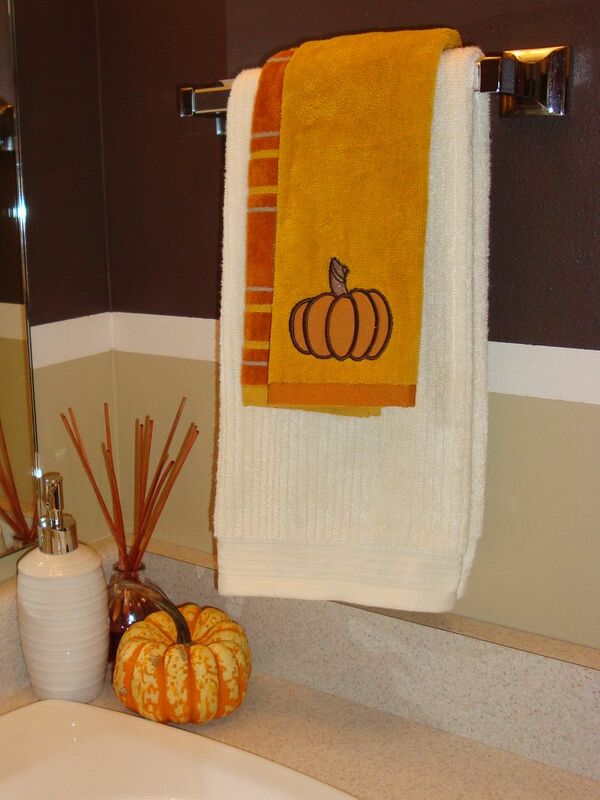 I love the pumpkin in the bathroom. I never would have thought to put one there. So cute! I love the table runner!! Please tell me where you got it! looks fantastic D! I’m going to miss your Christmas decor- although you do have a pretty decent excuse. haha! I just found your blog and I love it, you have a new follower for sure! Everything looks so nice! I’m head over heels in love with your orange table runner! LOVE the table runner. Where did you get it? I agree with PP, I love the table runner! this looks awesome! jealous. jealous. I would also like to know where the runner is from! Your fall decor is just perfect – not too over the top. @K*OS–I’m so surprised to hear that Canada doesn’t have a Target! I hope you get one soon–you’ll love it. @Colleen & Danielle–The table runner is from Pottery Barn. I got it on clearance a few months ago for only $6! @blondie–It’s the taking it all down part that I know I’ll never get to. If I could hire you to do it for me then you’ve got a deal, lol! Whew–soooo glad to see that the runner is wrinkle free in this photo, LOL!! I remember the last time you featured a runner there were a few wrinkles!! You are catching on to this blogging thing!!he,he,he! the decorations are fab!!! 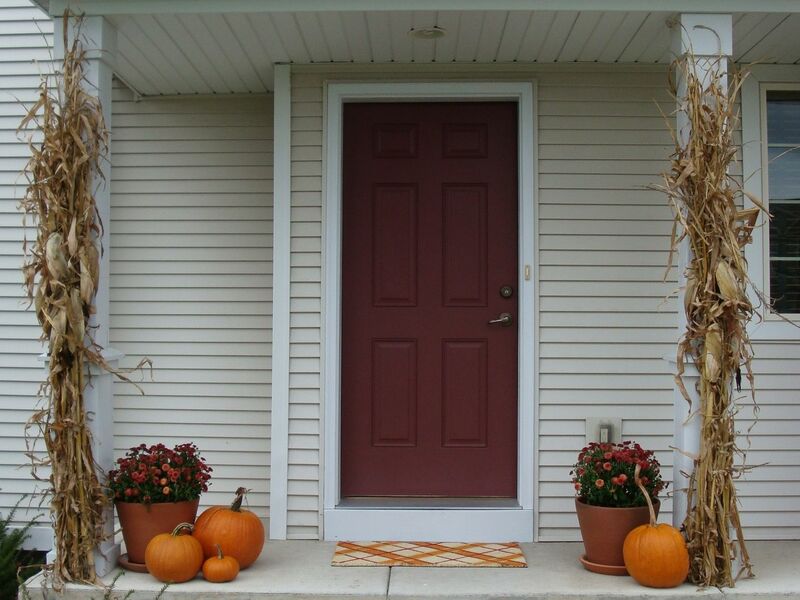 You must have tons of storage in your house to keep all of the great festive decorations you have for every season. So glad to hear you are feeling better too!! Stay well. I also love fall! Awesome decorations-subtle but beautiful! Love that doormat, too cute. I have always loved your home decor taste, you seriously need to do more home posts before baby G&D gets here!!!! Have a Happy Halloween! MAN I love your house.